Working out how many staff your need in a contact centre is straightforward task, but it is easy to make mistakes. We have condensed all the information that you need to make this calculation into an easy-to-use, eight-step process, and we have also covered what you should NEVER do when making this calculation. The first step in calculating your staffing needs, is to work out how many calls are coming into your business. There are many ways in which you can work out the number of calls coming into the contact centre, but your method will depend on which sources of information you have access to and your call centre’s background. As there is a difference between inbound and outbound calls, the needs of you call centre will be different. The following list considers this and presents you with a number of options that you can use to make the calculation. a) If you are part of an established call centre, you should be able to take an accurate calls-per-day figure from your call centre telephone system, commonly known as an Automated Call Distribution (ACD) system. b) If you do not have access to ACD results, your call-logging system and/or switchboard will provide a suitable alternative. This is commonly found in Call Detail Records (CDRs). c) Failing options a and b, a report from your telephone company may supply you with the relevant data if you are using managed numbers, e.g. 0800.
d) Asking staff to manually log the number of calls coming into the contact centre is an option if you do not have any of the information above. e) If you were to track the number of accesses coming into the CRM system, this could also reflect the number of calls coming into the business. If you cannot use any of the options listed above, you should make an estimate by following the procedure below. Firstly, you will need to know the size of your customer base, the number of days your contact centre is open in a year and to make an estimation of the average number of times a customer will call each year. Click here to read our article How to Set up a Call Centre to help you consider the requirements of your call centre. This is easily done if you have an ACD system or a CDR for your call centre. As you can see from the table above, your ACD system will be able to provide you with masses of information, including the number of calls that come into the contact centre over a defined period of time. You can make sure that you are collecting the right information from your ACD, by taking a look at our article What to Look for When Buying an ACD. Whilst the example given shows the daily report from the ACD system, it can also provide you with information for your desired time span. In this case, every half an hour or hour. If you don’t have access to the information above, you can make an accurate estimation. This is best done by using a call-arrival pattern similar to the one below. 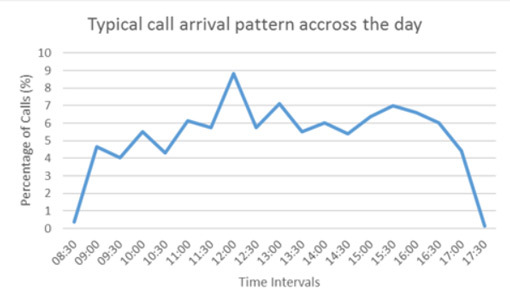 This graph highlights the expected call volume in a call centre which is open from 9am to 5pm, for each 30-minute period of the day, as a percentage. By following this pattern and inserting the average number of calls your company gets in a day, which you will have discovered in Step 1, you will find out how many calls you receive every half an hour. Average Handling Time (AHT) is the amount of time that a contact centre advisor spends related to a call. 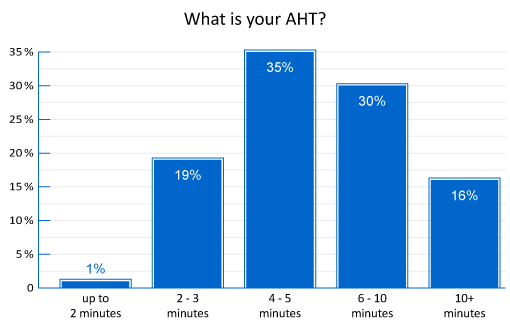 Typically, AHT = Call Duration + Average Wrap-Up Time, and you can drive these times from your ACD system and then calculate an AHT. However, if this information is not available, the next best thing would be to time customer–advisor interactions, including hold time, total talk time and wrap time, in different circumstances. 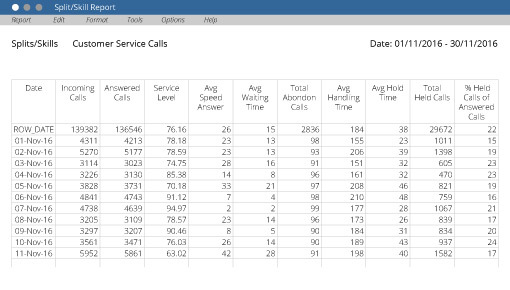 When you have done so, you should then add all the times recorded together and then divide that number by the total number of calls that were timed. This calculated figure will represent your AHT. For the full guide on calculating AHT, read our article on how to measure Average Handling Time. The calculated number will vary depending on the which sector of business your call centre represents. This is reflected in a Call Centre Helper poll, which showed a great difference in between the AHT of different companies. However, from the poll, we discovered that 4.9 minutes (294 seconds) was the median AHT for contact centres. So, if the two options discussed above are not for you, you can use this value in the stages below, or find out the truest to your contact centre using the table below. However, whilst AHT is important in this scenario, try not to assess your advisors against it. This is because if your advisors are too eager to get the customer off the phone to meet their targets, then perhaps they are not providing great levels of customer service. This may also result in the customer calling back. For more on this, read Want to Increase Customer Satisfaction? Stop Measuring Average Handling Time (AHT)! Step 4: What should your service level be? The industry standard for service level has historically been to answer 80% of calls within 20 seconds. However, modern contact centres are moving towards 90% of calls answered in 10 or 15 seconds. Yet, it would be impossible for your call centre to reach a target of 100% service level, as this would require an infinite number of advisors. The graph below highlights how an alteration in service level will cause a change to the number of agents that you should employ. Ultimately, though, it is up to you to decide on a service level that keeps you competitive and does not involve recruiting too many advisors. For more advice on this, read our article on How to Calculate Contact Centre Service Level. For more information on which service levels other companies target, please download our survey on What Contact Centres Are Doing Right Now. Now we have set a service level, we need to recognise that agents cannot spend 100% of their time on the phone, for extended periods of time. This is where occupancy, the amount of time agents spend on the phone over the course of the thirty minutes, comes in. Maximum occupancy is often a factor that is ignored in the process of calculating how many agents you need in the contact centre. This doesn’t make any difference in a small contact centre, but is a major factor in why so many larger contact centres are understaffed. To understand if you need to take occupancy into account, you first need to set an occupancy target, just as you would for service level. To work out what the level of occupancy should be, read our How to Calculate Occupancy article. James’s clients would have set an occupancy rate target of 85-90%, to find the ideal mix of productivity and achievability. A higher than 90% occupancy rate would likely lead to agents picking-up undesirable behaviours on calls, succumbing to burn-out or the contact centre having increasing attrition rates. But how do you know what your occupancy rate is? You simply divide the number of erlangs (traffic intensity) by the number of agents on the contact centre floor and then multiply it by 100 to attain a percentage occupancy figure. A worked example is given here. But, if every contact centre has an occupancy rate, why does it matter for large contact centres and not those that are smaller? This is because, when call volumes increase, as does the number of calls an advisor has to take in 30 minutes, meaning that occupancy gets higher and higher. This increase in the “staff workload ratio” is highlighted in the table below. The table shows that at 1000 calls the occupancy rate is 92.8%, which, although we encourage agents to be productive, just is not realistic. So, just like service level, set a target, which would usually be somewhere between 85-90%, to put into the Erlang calculator. The information gathered for the previous four steps will allow you to work out the raw number of advisors needed to man the phones in the call centre, but it does not take shrinkage into account. Shrinkage is the amount of paid time that an employee is not available to do productive work, such as answer phone calls, despite being scheduled to do so. This includes both internal call centre shrinkage, where an advisor is in the call centre but cannot answer the phone, and external shrinkage, which is when an advisor is out of the call centre due to sickness, holidays, emergencies etc. We have a downloadable Excel Erlang C Calculator which factors in shrinkage. Generally, shrinkage in the call centre accounts for 35% of staff who are not using the telephone at any given time. However, this is just an industry standard, and it is important for you to accurately calculate your shrinkage in order to provise a precise number for how many staff you need. To do so, please follow our guidelines on how to calculate contact centre shrinkage. Now that you have calculated figures for the number of calls for every 30 minutes/hour, call duration, service level and shrinkage, you can enter them into our Online Erlang Calculator. 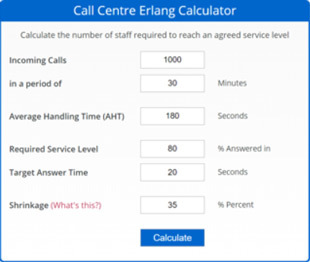 Call Centre Helper’s Erlang Calculator is better than most as it allows you to determine how many call centre advisors you need during each 30-minute period of the day, with specific reference to shrinkage. In this example, the Erlang Calculator determines that 165 agents should be employed. If you would prefer to calculate staffing numbers in an Excel spreadsheet, we also have an Excel Based Erlang Calculator, which is very popular. Whilst it is important for you to match the call-arrival pattern with the number of advisors manning the phones, it would be implausible to hire staff for 30-minute periods every day. Adding a day planner to your staffing calculations, with help from the Erlang Calculator – Day Planner will help you manage this. 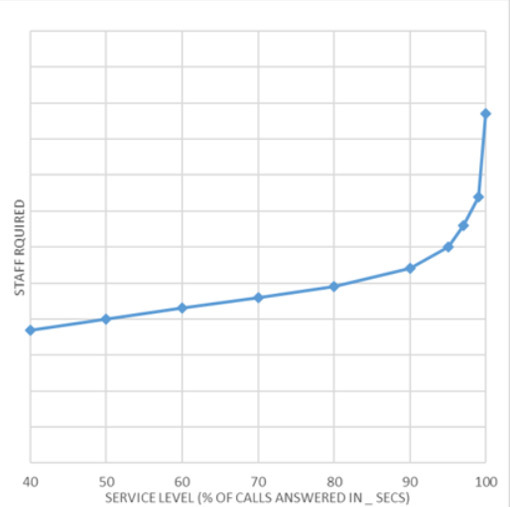 If you do this successfully, you will always have the optimum number of staff in your contact centre and they will be blocked around the call-arrival pattern, like in the graph below. For longer shift patterns or call centres that are open for 24 hours a day, 7 days a week read our advice on how to staff a call centre for a 24 hours. How NOT to calculate staff numbers! 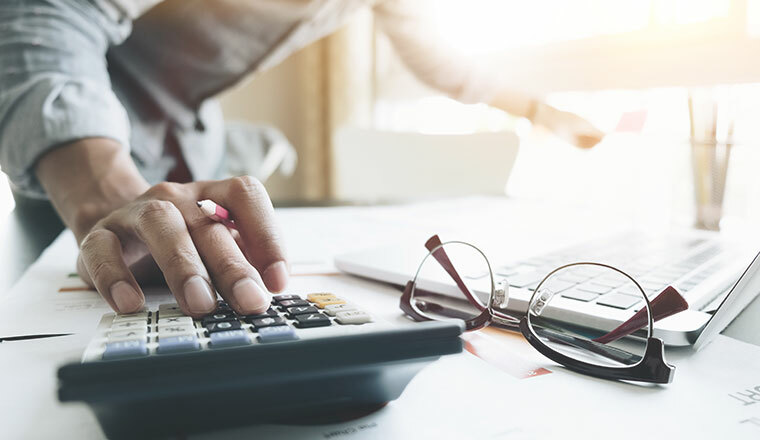 It is very important that you avoid the most common mistake in calculating staff numbers, because if you do not, you will be severely understaffed. This mistake involves dividing the total number of call minutes by the number of hours in a day. 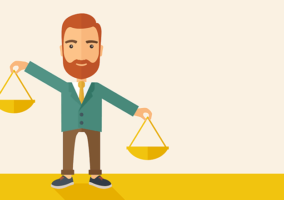 5,000/150 = 33 advisors required – this figure will leave you very understaffed. Holidays, sickness and meetings, etc. So, please avoid this method at all costs and instead follow our seven-step process above. 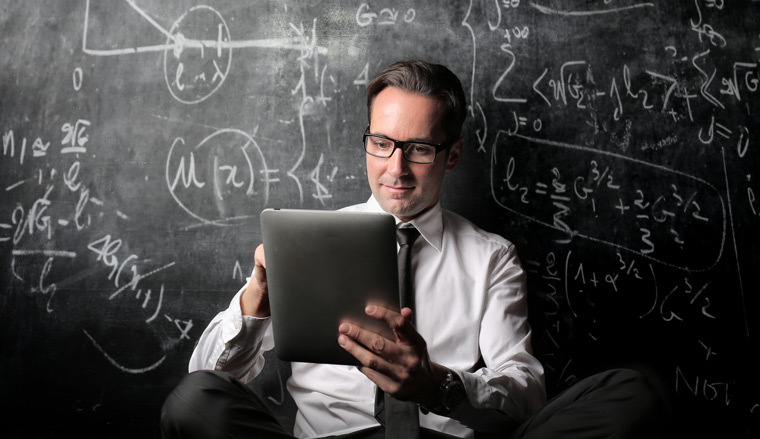 Furthering this, check out this article for 10 Things You Must Know to Calculate How Many Contact Centre Advisors You Need, things you need to factor in for staffing a call centre. Which processes have you used? What have been your experiences? Would appreciate if anyone can help me here . I have is call Center which includes inbound calls as well as tickets are coming from a mobile application, these tickets / cases are getting created by the customer through the app then getting converted to a CRM cases , however the app is 24/7 and currently I am receiving almost 150 cases everyday handled by 2 agents, but most of the time theses cases are not handled within the SLA and I feel 2 agents are not the right number. Would anyone tell how how to calculate the number of required agents to handle this volume of cases , not sure if I can teach the exact AHT for the 2 agent as they call the customers as well as the sales team and our staff to resolve a case and both duration ( outbound made to customer and outbound made to our team are totally different ) as well the ACW. Hi, Could anyone help me answer the below question. Assuming the FTE is calculated based on required service level, what implications would happen if we deploy less than the required FTE. For example if 50 FTE is required to meet GOS of 60/60, what if we have 35. Thank you so much for this very comprehensive document. This method seems perfect for a center working 5 days a week with fixed weekly off’s. However, if the center works for all 7 days a week, then it’s obvious that there wud be rotational weekly offs. How do we get that into consideration when calculating staffing? Very Nice and comprehensive Information shared !! Most of the things mentioned makes perfect sense. I do not understand where you use Step 1 in the rest of steps. It seems to me the real calculation starts from step 2. 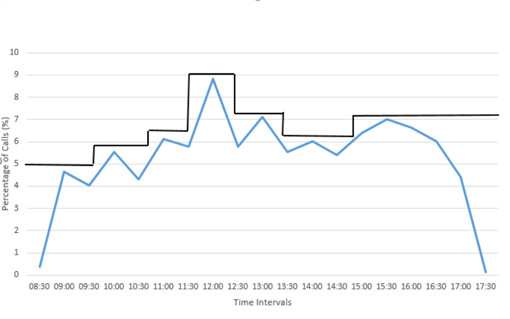 The sample data you used is applied to 30 min interval. That is to calcuale the number of staff required in 30 mins. As we know, we have peak periods/trough periods during a day, during a week, during a month, during a year. The seasonabily comes along as well. There may be a trend as well in the data. Do we for example, work out peak seasons, number of call for every 30 mins/hours and off-peak seasons, number of call for every 30 mins/hours during a year’s course? I am not quite clear on this. Will you please guide me here? I also do not see the forecasting is used here. Will you please adivse? I have a Call Center which includes inbound calls as well as tickets are coming from a mobile application , these tickets / cases are getting cretead by the customer through the app then getting converted to a CRM cases , however the app is 24/7 and currently I am receiving almost 150 cases everyday handled by 2 agents ,but most of the time theses cases are not handled within the SLA and I feel 2 agents are not the right number . Would anyone tell how how to calculate the number of required agents to handle this volume of cases , not sure if I can teach the exact AHT for the 2 agent as they call the customers as well as the sales team and our staff to resolve a case and both duration ( outbound made to customer and outbound made to our team are totally different ) as well the ACW. For 150 inbound contacts if i consider for every call rep makes outbound so we double up the volume we make it 150*2 . Now if we consider 6.25 contacts in hour we consider AHT to be 20 min in total to handle inbound and outbound on same call and every call . we will need 4-5 reps in HOOP of 24hrs . I would go with your gut instinct. If you feel that it is understaffed it probably is. I would look at a day and look at the work queue manually, task, by task. Using screen recordings is the best way to do this. It will take a while but will be the best way to confirm your suspicions.